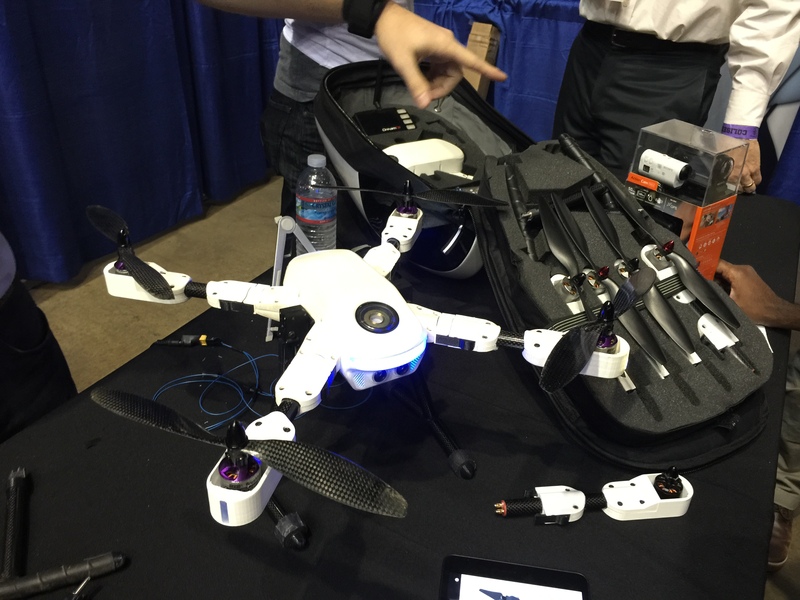 The LA Drone Expo – Is it really all about the Drone? 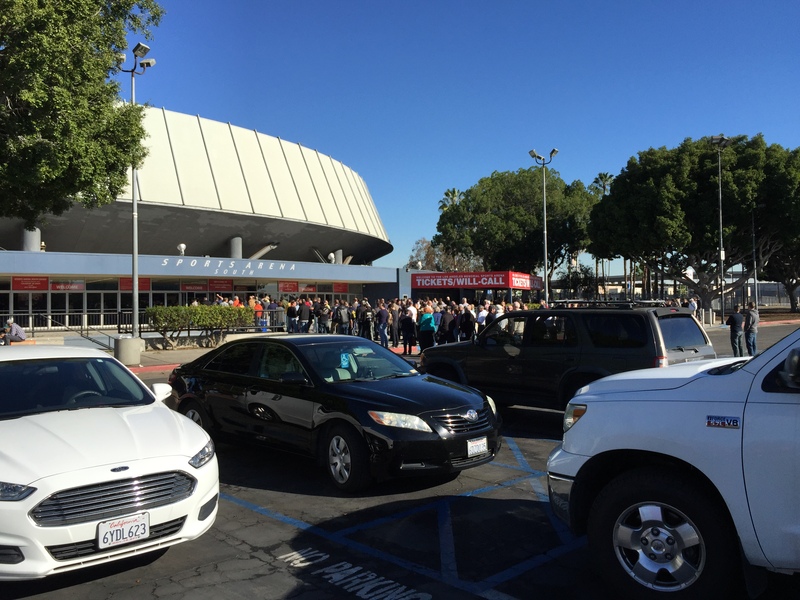 On Saturday 13th December, I had the fortunate opportunity to attend the first Los Angeles Drone Expo held at the LA Sports Arena. 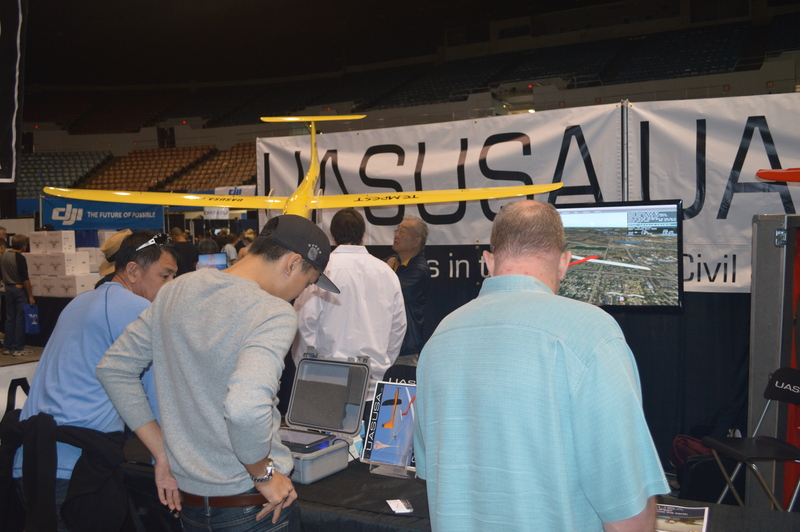 The Expo was organized by the UAV Systems Association in collaboration with the Tesla Foundation. Doors opened at 10am to a full crowd and closed again at 7pm. 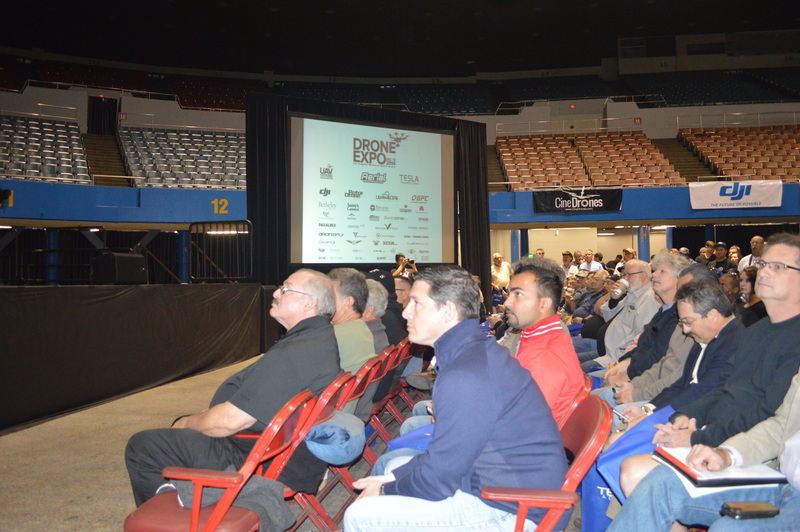 The Expo crowd ranged from local to national visitors, exhibitors and speakers. The Expo was aimed at the small business consumer and commercial market, and it was well represented by the leading companies in this field. 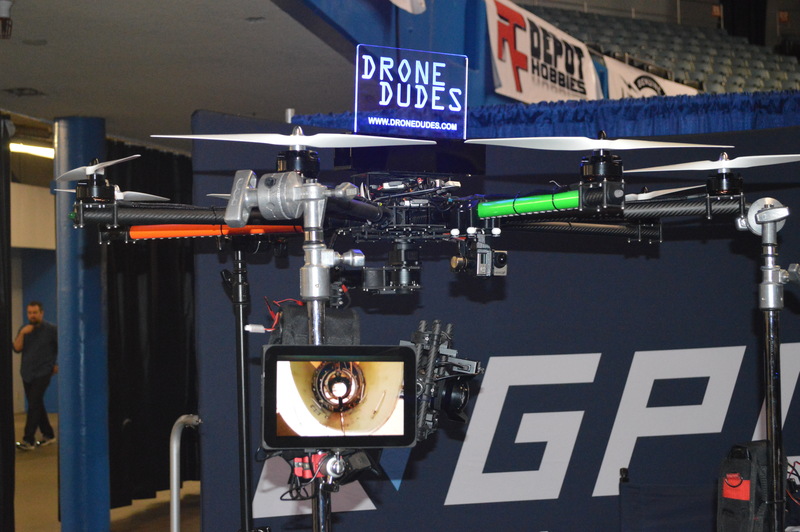 In particular booths that stood out were those by Aerial Media Pros, DJI and Drone Dudes. One point that was glaringly obvious is that it was virtually impossible to walk past a booth without seeing a DJI Phantom, they were just everywhere. DreamQii got a lot of interest as well, it is easy to see why they have raised over $1.3Million on Indiegogo based on the interest at their booth. The days of crowd sourced drones are upon us given the success of the DreamQii on Indiegogo, and Air Dog and Hexo+ on Kickstarter. 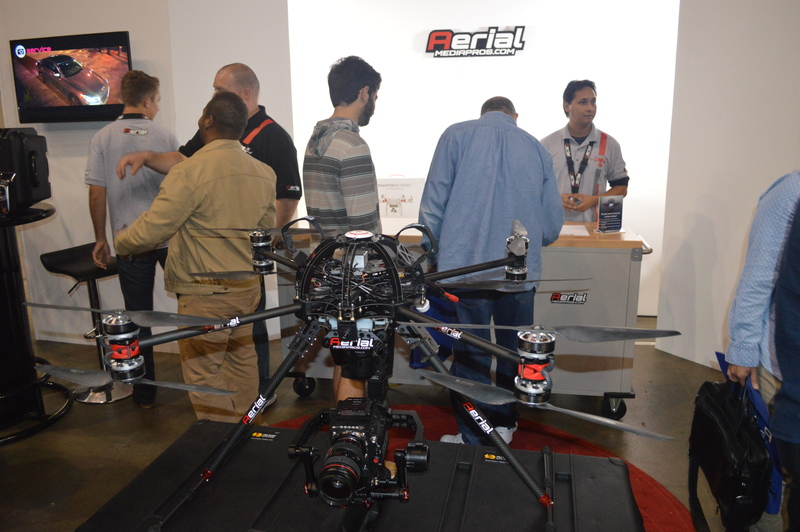 Talking more about the exhibitors, the Expo was split between FPV racer, GoPro capable drones, Heavy Lift video drones lifting Red Epics, rounded out with numerous fixed wing drones and Software vendors. There were two omissions that did catch the eye. 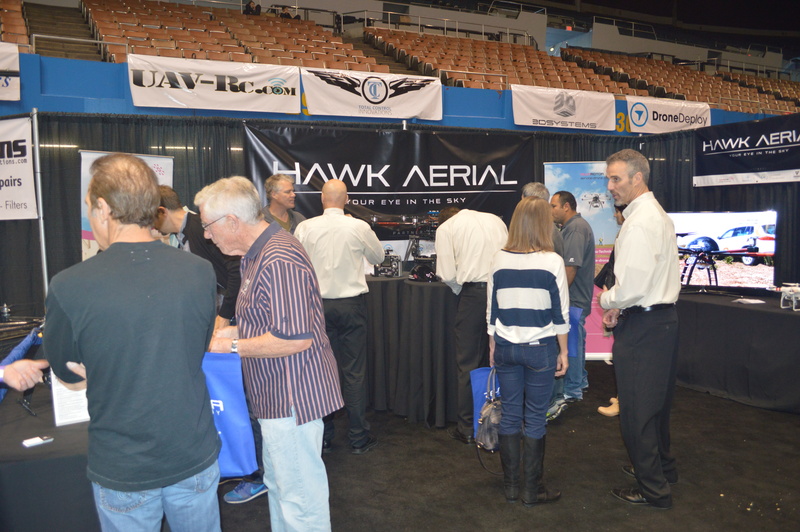 3D Robotics and Precision Hawk, although they were Sponsors they didn’t have booths at the Expo. 3D Robotics though was represented by Brandon Basso who did attend as a speaker. 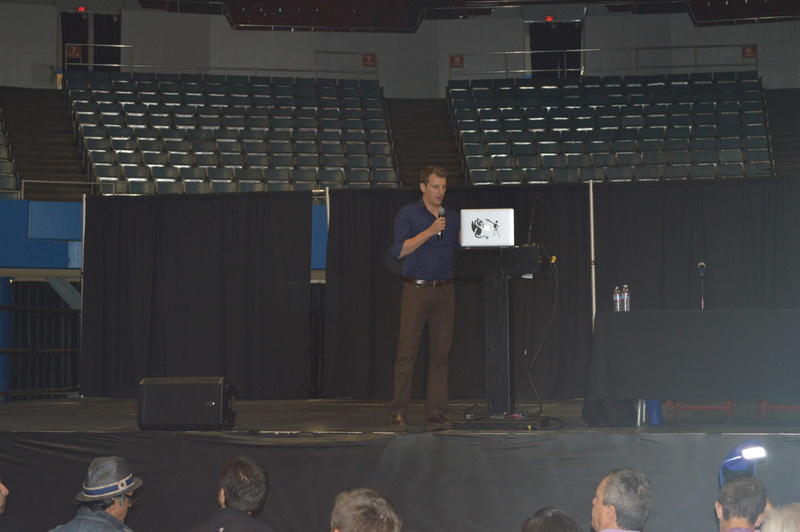 The speakers attending the LA Drone Expo were a well-rounded group with a list of UAV Specialist from different fields. Examples are Brandon Basso from 3D Robotics, Chad Colby from 360 Yield Center covering Agriculture, Gretchen West formerly Executive VP of AUVSI covering present UAV business environment, Jono Millin from Drone Deploy, Antoine Martin of Pix4D, Lisa Ellman with her Polivation speech. The list goes on. Feedback from the Expo crowd was that the speeches and panels were well received, and attendance at the panels was high. 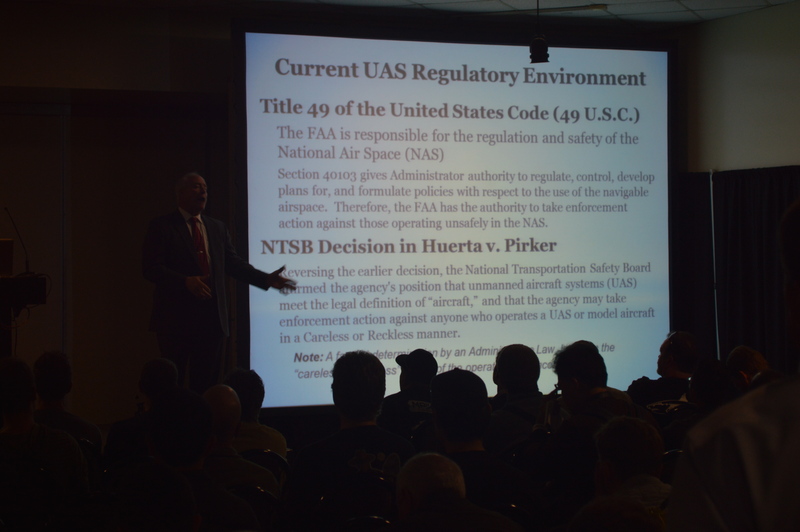 They were two noticeable events in the speaking session, one occurred when a former government employee interacted with the crowd in a brash interactive manner when talking about UAS regulations, which didn’t go down well. The room was full, as regulations are a focal point of interest for the commercial UAV community, however it was hard to swallow missives about careless UAV operation and we as a community had to be regulated to protect ourselves. You can imagine the atmosphere. The other event was when a protest occurred near the main speaker stage. I wasn’t near the stage when this happened, but it appears the protest was about Military drones and Codepink, which was a bit off the mark as this was a commercial UAV Expo? A couple of small points did exist with the Speaker sessions, the timetable was not well advertised apart from on the Expo website, speakers were shuffled in order, and to compound issues there were two speaking stages and most people didn’t know the second stage existed. A number of people commented to me how they had missed presentations and panels due to these issues. Also the presentations were not videoed for later posting on-line. 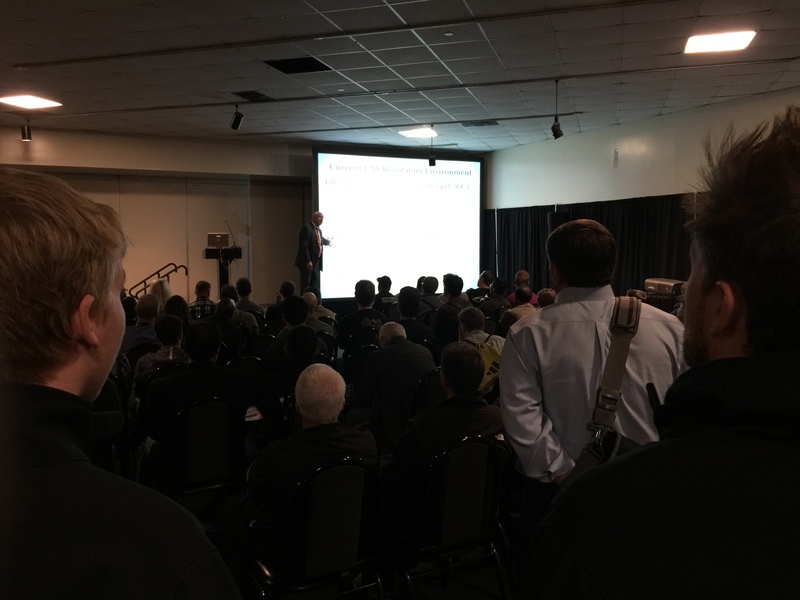 Having organizing and attended conference I understand the significant work involved in putting on an event of this size, and I’m sure AUVSA will correct these issues for next year. Well you cannot go to a consumer and commercial drone expo without the present FAA situation been discussed. 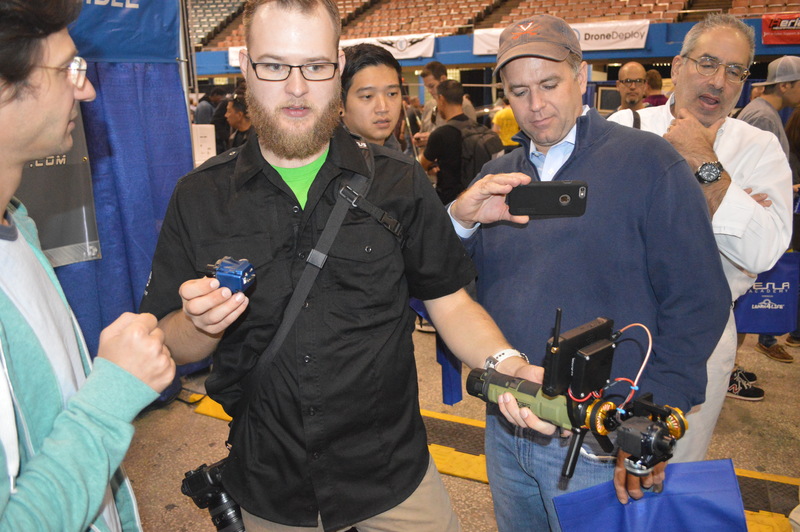 I talked with a good representation of people at the Expo, ranging from FPV racers, Phantom flyers, Commercial Video operators, Ex-Military UAV Operators, to company CEOs and Directors. 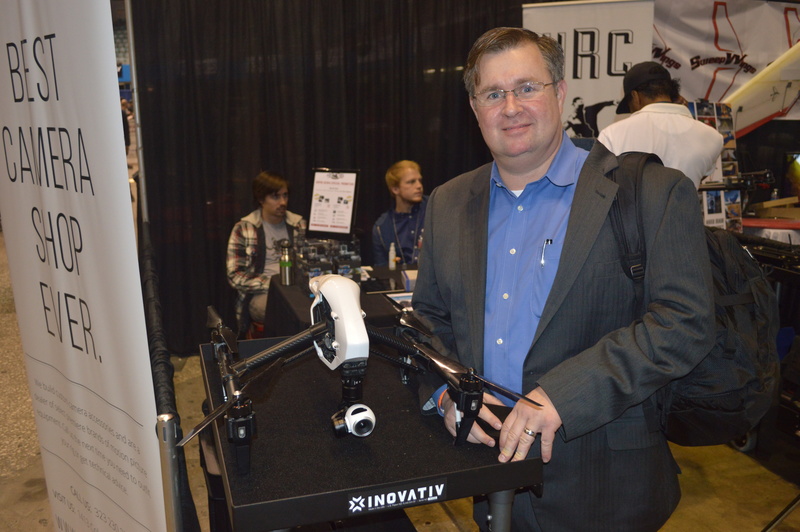 There were many opinions but one common theme, the commercial UAV technology is evolving at a faster and accelerating pace and the FAA is failing to keep up. In a matter of fact most people believed the FAA is falling behind further each day, with one operator saying “The FAA is just in over its head and has no idea what to do.” Pretty sobering information. 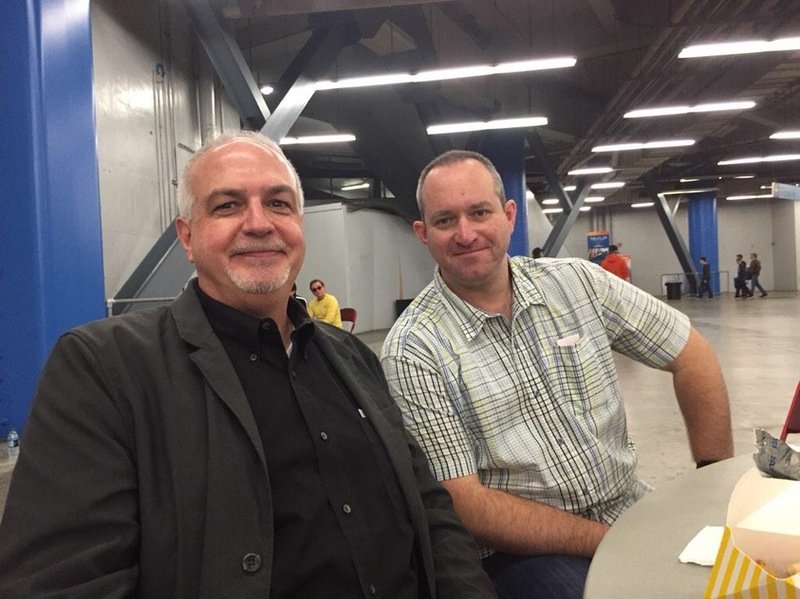 I also sat down with Colin Snow (@DroneAnalyst) and chatted about our pasts, plus present observations and experiences and what the future holds. A drone theme was solidified from this discussion, which has been coming to the forefront of my thoughts over the past months, and from discussion with exhibitors. The drone is really just a tool or platform, much as a saw is a tool to a Carpenter. The purpose of a drone is to add a new perspective, to give us information from above in a more efficient and cost effective manner than manned and space based platforms. This is true if we are talking about photography, video, mapping, crop analysis, wildlife observation etc. The drone is really a platform for a sensor, what we are now seeing is that the information and data from that sensor payload is the focal point. Next once we have the data, how do we process that data fast and efficiently to generate actionable data, data that is useful to the end user. To this end, you see companies such as MicaSense who closed $2Million in capital from Parrot. Chad Colby was kind enough to show me a MicaSense camera, which is a multispectral camera with 5 sensors with a 1.6 Mpixel resolution. This pitches it right into TetraCam territory, but with a $6500 price tag and the ability to use GoPro batteries and other useful functions. Using multispectral sensors you can generate more data on the same flight. This can be useful where different crops and crop issues react in different spectral bands. 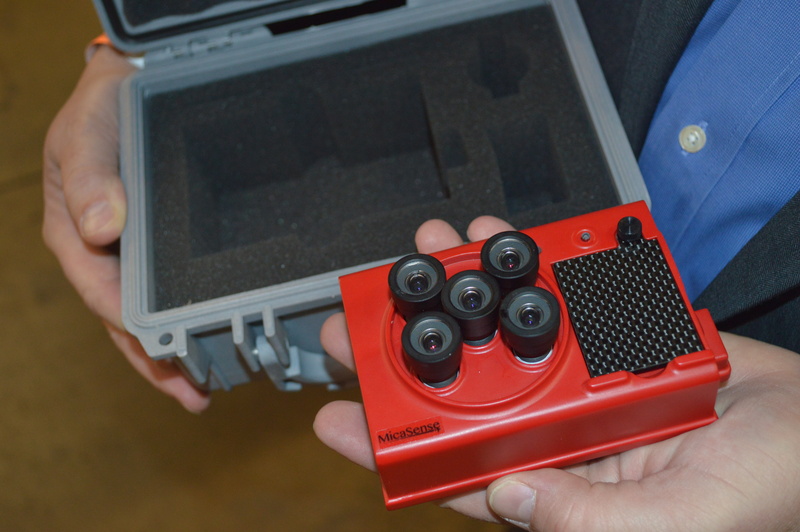 Here the multispectral camera should come into its own, helping improve crop yields. FLIR and IR-DISTRO were also present, representing the IR sensor market, with higher refresh frequencies and higher resolutions. Then you have Peau Productions, GoPro and Red Epic, with the video market. 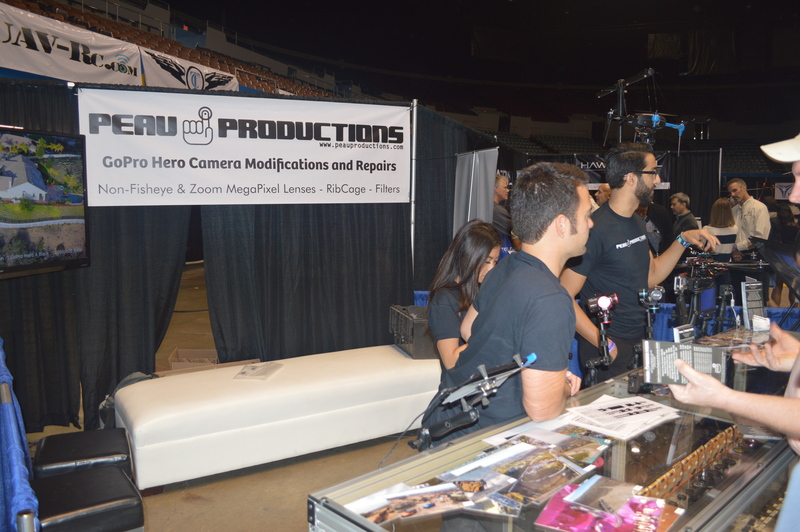 The Peau Productions booth was always 2 to 3 people deep, the interest in the GoPro modification market is very strong. Now data without processing is useless, and this was discussed a number of times, Bret Chillcott owner of Ag Eagle and Chad Colby from Yield 360 explained how flying the fields is great, but you just generate so much data, that present processing techniques require too long to generate actionable data. In an essence your processing cannot keep up with how fast data is generated. This is only going to get worse as multispectral sensors such as MicaSense become more widespread. To overcome this companies like Pix4D and Drone Deploy are coming up with innovative ways to reduce the time from capturing data from flying, to generating actionable data. 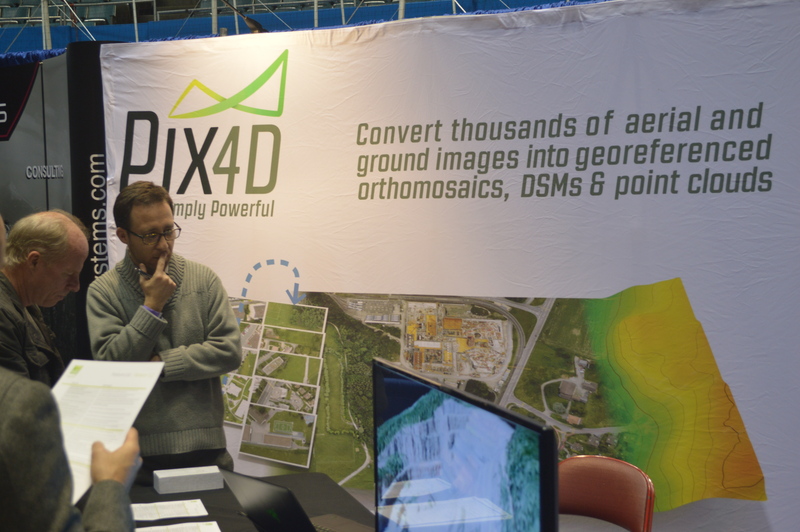 Pix4D which was at the Expo for example has streamlined its processing, and has new algorithms to address multispectral cameras. Here one camera is defined as the master and the majority of camera position relative to image processing is done on this camera, the remaining cameras are then treated as copies with defined distance offsets in X & Y from the master. In this way the multispectral camera data can be processed much faster. I’m a Pix4D user, so these improvements look very promising with new GPU and multi-processor options and a new 3D textured mesh model. 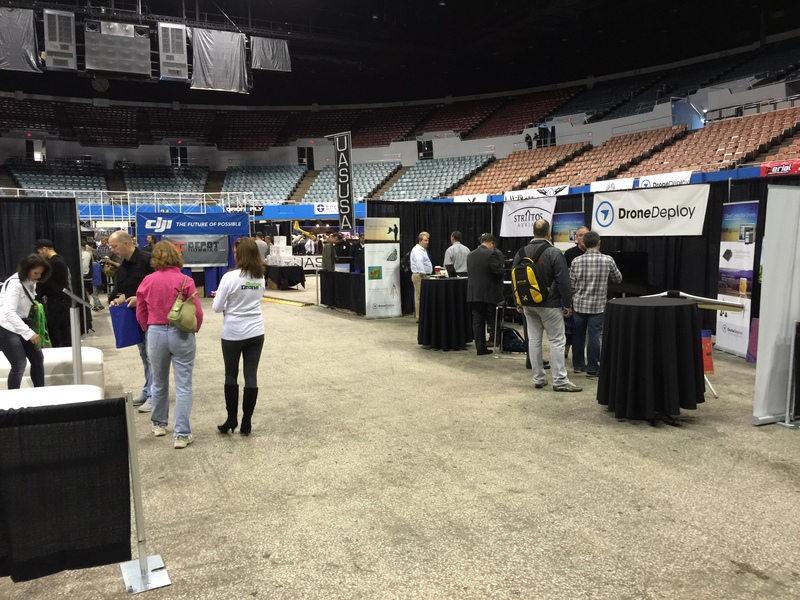 Drone Deploy also present at the Expo has a more distributed processing approach and uses Cloud processing. As the drone is flying, images are loaded via cellular network to the Cloud, where high speed servers process the data whilst the drone is still in the air. 15 to 30 minutes after landing, actionable data is generated. Additional functionality exists, where the copter or plan, can be programmed, flown, and final data reviewed all in the field using just an iPad style tablet, smartphone or laptop. So what Drone Deploy have just done is made drone flight possible with almost real time actionable data for the farmer in the field, the inspection team looking at solar farms, to the construction inspector. What is also innovative is that as the system is Cloud based, the UAV can be flown by an operator, whilst the data can be reviewed by an analyst thousands of miles away. 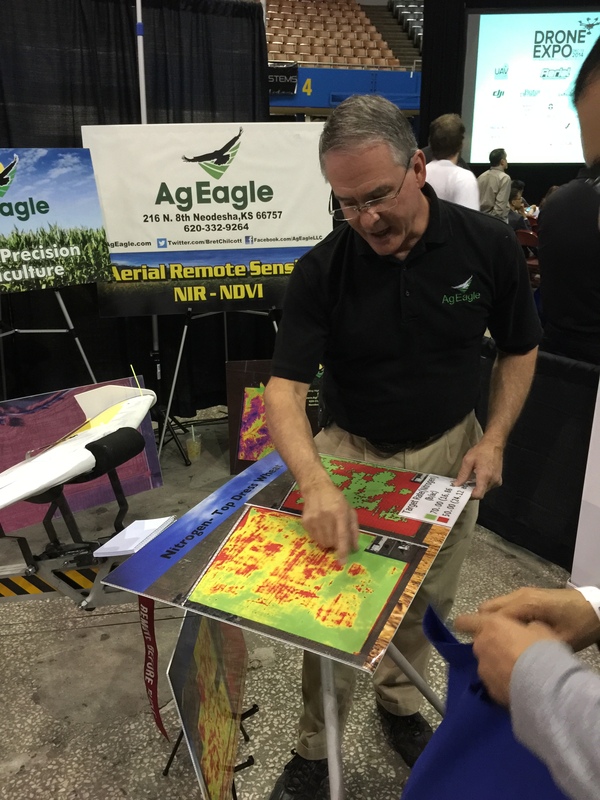 This means multiple global UAV operators can feed data back to one remote analysis person/group. Even more impressive is that Drone Deploy also allows you to fly multiple drones from one site concurrently. 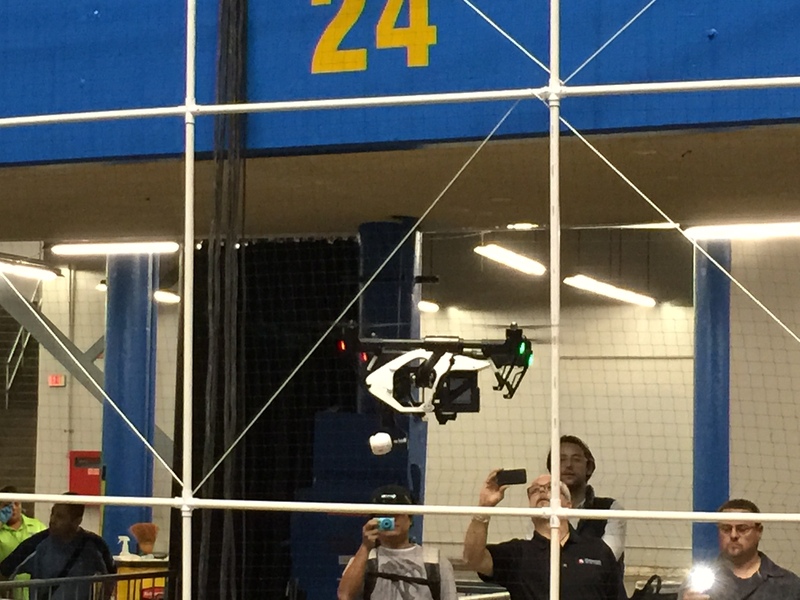 You don’t need to be a RC hobbyist to generate actionable data from drones anymore. 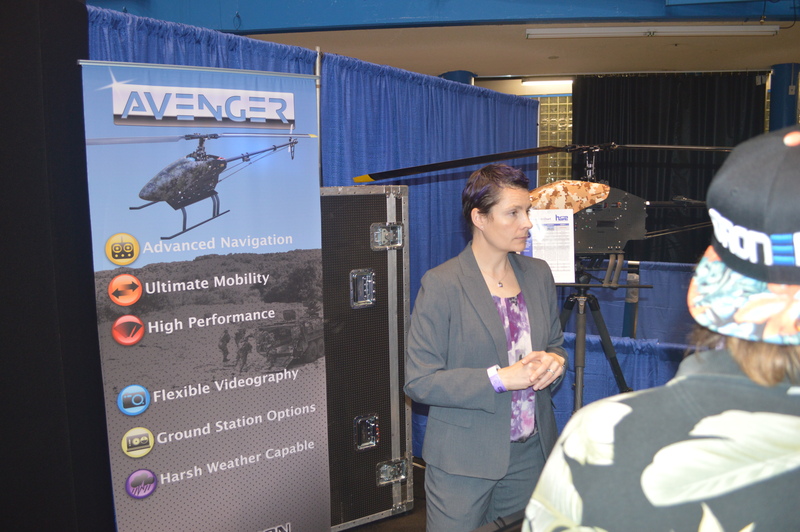 Just ask Gretchen West, she was the Executive VP of AUVSI and an advocate for a decade in commercial UAV operation. 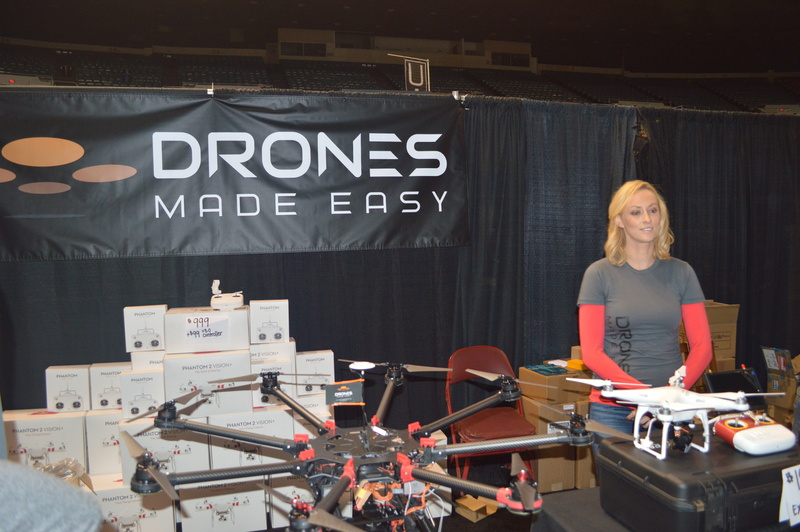 It was announced at the LA Drone Expo that she is now joining Drone Deploy as it’ Business Strategist and Regulatory Affairs spokesperson. I do believe Drone Deploy is on to something. I’ve recently tested Drone Deploy myself in the field and I was impressed, how it simplified the end-to-end workflow for actionable drone data. What was good to understand, is that my impressions were backed up by other Expo attendees. 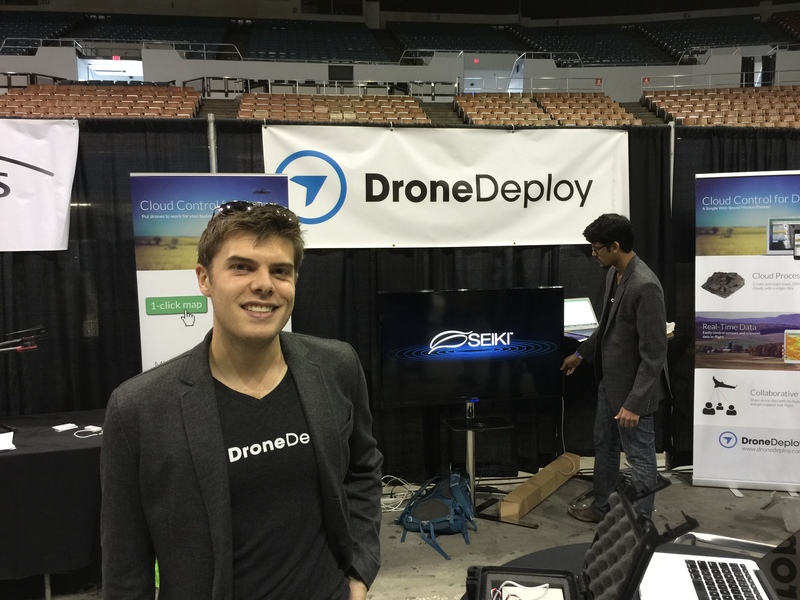 Another innovative software drone company was the new startup Pixie Path. Again this company is looking towards the Cloud, but with the intention of cloud operation of drones. This in a sense is along the path of Drone Deploy, but here the operation is more autonomous than autopilot and data gathering. This style of autonomous cloud based flight operations removes the human, and allows a Cloud system to interface and control the drone/s. In a sense the human element and hopefully human issues are removed, although I wonder how the FAA will react to that. The hope is in the future this style of drone operation will allow easier integration into the National Airspace (NAS), as cloud drone operations can directly interface to ATC. It’s an interesting concept and worth watching. So what was the key takeaway for me from the Expo? The North American commercial drone community is innovating and thriving, the barrier is policy and regulations. This is a long told story. 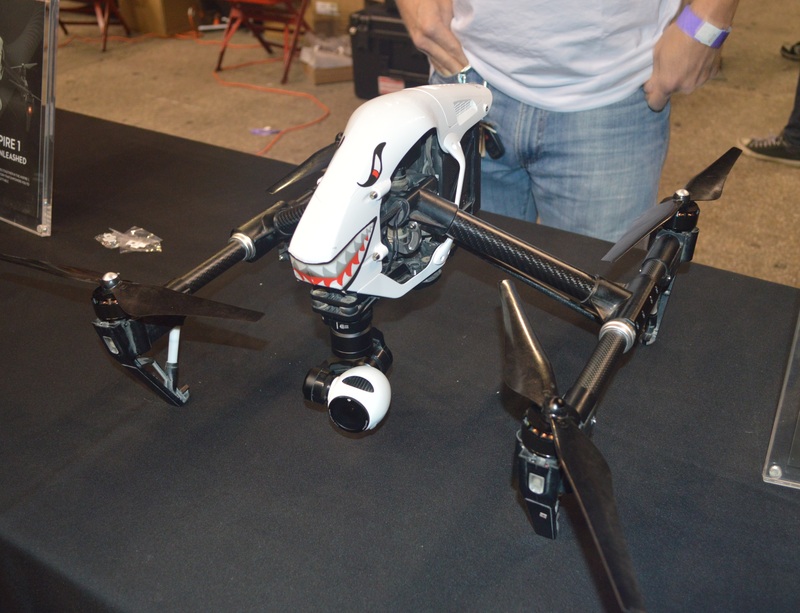 What is an emerging trend though, is how the drone community has matured over the past year. Drones have gone from been purely military, to the Phantom stage, and now we are entering the emergence of the professional small commercial businesses. The focus is now shifting away from the drone, but more to what applications can we use them for, how do we do it more efficiently, how do we help generate actionable data? It’s not about the Drone, it’s really all about the data.